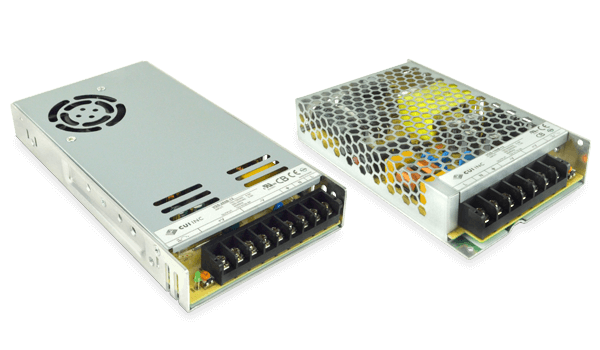 CUI’s Power Group has announced a new line of compact, chassis mount AC-DC power supplies housed in an enclosed metal case. The VGS-B series offers power ratings from 35 W to 350 W with low 30 mm profiles and compact packages as small as 99 mm x 82 mm x 30 mm (3.89″ x 3.22″ x 1.18″). Delivering no-load power consumption as low as 0.3 W and an operating temperature range of -20°C to +70°C, these rugged, metal enclosed power modules are well suited for reducing standby power usage and optimizing available space within commercial and industrial applications. CUI’s VGS-B power supplies carry single output voltages of 12, 24, 30 and 48 VDC, depending on the series, and an adjustable output trim. While most of the series are convection cooled, the VGS-250B and VGS-350B series both feature built-in cooling with a temperature-controlled fan. All models further feature a screw terminal interface, along with over current, over voltage and over temperature protections. Safety approvals for the VGS-B series include UL and EN 60950-1 as well as EN 55032 for conducted and radiated emissions. The VGS-B series are available immediately with prices starting at $14.07 per unit (100s) through distribution.